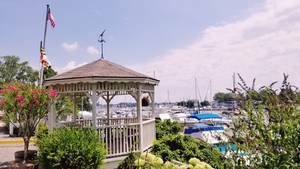 Our marina has deep water slips, all have water and metered electric. 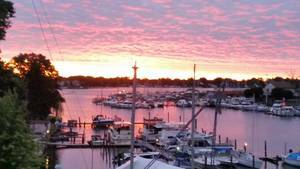 We can accommodate boats from 19' to 50'. All slips have their own finger piers. The slips are available as seasonal, monthly and transits. We have a number of electric lifts for boats up to 32ft. The property has a security gate which is accessed with a gate card. The gate is closed when the office closes. Both the mens and ladies restrooms are tiled and have private showers with dressing rooms and are open 24hrs a day. 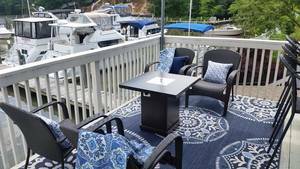 We have a huge deck which can be used by all customers for, relaxing, parties, tanning, cookouts, or whatever you want. 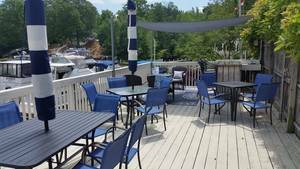 The deck can be reserved for private parties at no cost. Just off the deck there is a gas grill and picnic tables. Under the deck we store dock carts for your use and dinghy and kayak storage. In the middle of our beautiful garden there is a gazebo which you can waste away the day by taking in the beauty of the flowers and the sound of the wind chimes and the fountain flowing into the pond. The service side of our facility is equipped with a new 55,000lb Marine Travel Lift, a work shop which can accommodate a 41' boat, a crane ,and a forklift. 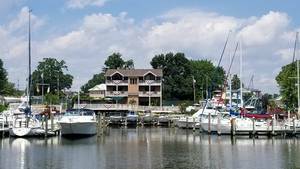 We are a full service marina with certified mechanics on duty. We are equipped to handle all mechanical needs, fiberglass reconstruction, gel coat repairs, and boat rigging. We are dealers for Mercury, Marine Power, Yanmar, Crusaders, Jasper, Mermaid air conditioning, Polar Bay Air conditioning, Waeco refrigerators, Sea Vac central vacuums, Sea Land Vacu Flush marine sanitation. Slip Rentals Starting January 1 Through December 31st. Call for rates for larger boats and monthly rates.